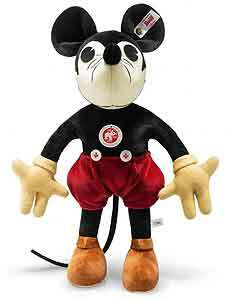 Our Steiff Mickey Mouse is a new interpretation of the original version of Mickey from 1932. Made of finest multicoloured Trevira velvet, this beautiful piece wears the famous gold plated Steiff button in ear and is a limited edition of only 2000 pieces worldwide. Steiff were the first company to make Mickey Mouse for Walt Disney. The version you see is based on Mickey's first appearances in the late 1920's and 1930's. The Disney company have a version of this on display at their offices in Burbank CA and asked Steiff to recreate him. He is not a replica, but exept for the modern filling material, is as close as possible to those early pieces. Size 33cm. Comes boxed, together with a certificate of authenticity. Ashby Bears proudly presents 1932 Mickey Mouse. Optimistic, cheerful and clever, Mickey Mouse is one of the stars of the comics of the 1930s. From the outset, he was designed for film. Set with a circular head and ears, with gloved hands and short pants, the little mouse can be easily animated. Walt Disney and his staff made good use of Mickey’s appeal, and since his sensational appearance in “Steamboat Willie” in 1928, Mickey has been featured in more than 120 short films. Mickey was even honored on his 50th anniversary in 1978 with his very own star on the Hollywood Walk of Fame. With the “1932 look”, Steiff 2017 presents a real classic, lovingly created from his mousey ears to the manually inscribed sole on his foot.